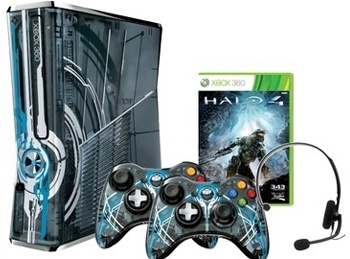 The only thing missing from the Halo 4 and Xbox 360 bundle is a Kinect. Let's face it - the Xbox 360 is selling like hotcakes. There's actually a fairly decent chance that you're even now thinking about upgrading your old first-generation clunker to that snazzy 'Slim' version. You've also probably heard about a little game called Halo 4, which continues the franchise that helped launch the original Xbox. If you've been eyeing either console or game, though, you might want to hold off a bit longer; Microsoft accidentally leaked an upcoming Halo 4 console bundle, and this one's got a lot of kit. Besides the expected features - the game, obviously, plus a specially-skinned console - the $399.99 bundle includes some nifty details, like blue LED lighting for the power indicators and custom sounds for boot-up and disc ejection. The console itself comes with a whopping 320 GB harddrive, which pretty much means you can install all the games. The two accompanying wireless gamepads, which are the new style with the transforming D-pad/circle-pads, have their own Halo-themed skin that reflects the graphics on the console. There's even a black Xbox Live headset, so you can experience the joy of epithets screamed into your ear. The console bundle was available for pre-order at Microsoft's store for a short time, but has since been de-listed. With any luck, the bundle will be properly announced at San-Diego Comic-Con this weekend, but either way gamers will be able to buy the bundle after the game's launch on November 6, 2012.